So I’ve decided I need more Thai food in my life. It’s so uniquely flavorful and it always leaves me craving more. 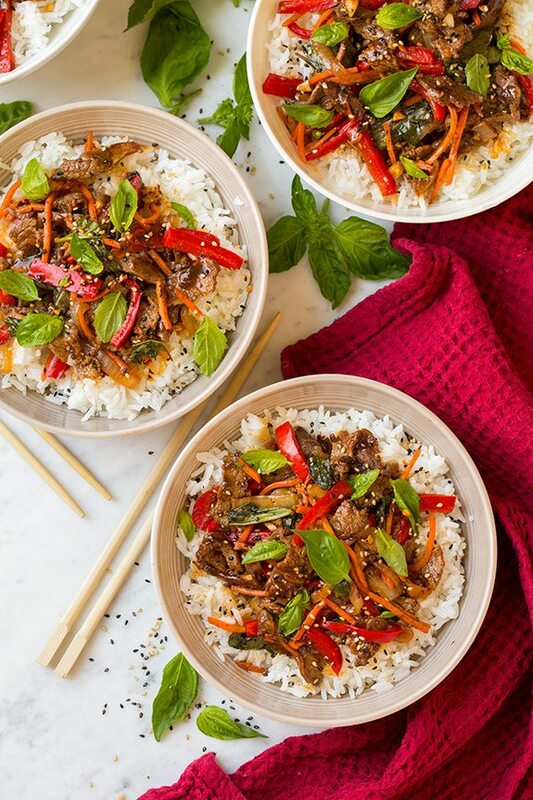 These hearty Thai Basil Beef Bowls are no exception to that! It’s a quick meal to throw together and it’s jam packed with amazing flavors! 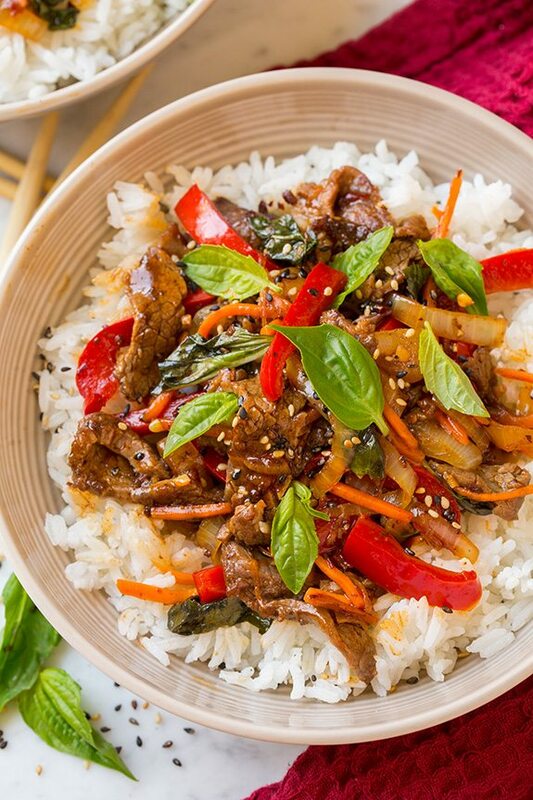 I love the way the sauce compliments the beef and of course I love the bold flavor of all the fresh basil used here (if you ask me fresh basil is one of the best ingredients known to mankind). If you haven’t tried much Thai food here is a great place to start. 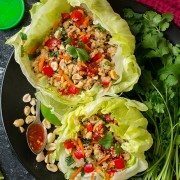 It doesn’t use loads of fish sauce, just enough to give it a nice depth of flavor, and it’s is an easy to follow straight forward recipe. 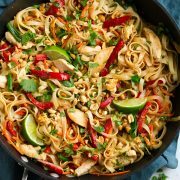 And once you buy the ingredients to make the sauce there are so many other recipes you can use those ingredients for (like these Thai Chicken Tacos, or this easy Chicken Chow Mein, or this Chicken Pad Thai. All of them are delicious btw). Then if you are into hot sauce, the Sambal Oelek is good on pretty much anything. Add this recipe to your menu and try something new this week! 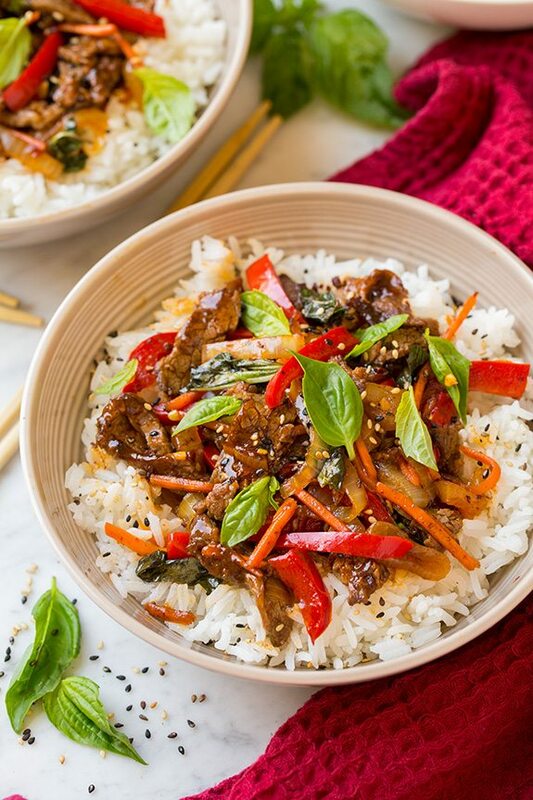 Thin pieces of flank steak are seared in a hot skillet, then bright fresh veggies are sautéed and you'll toss the two together along with a deliciously flavorful sauce. Then serve over tender jasmine rice to complete the dish. A quick weeknight dinner you'll love! Prepare rice: Cook rice according to directions listed on package. For the sauce: In a small mixing bowl whisk together soy sauce and cornstarch until smooth. Stir in water, fish sauce, oyster sauce, brown sugar, lime juice and Sambal Oelek if using, set aside. For the beef: Toss beef with 1 tsp oil and 1 tsp cornstarch. Heat 2 Tbsp oil in a large skillet or wok over moderately high heat. Add beef and cook until browned on both sides but still slightly under-cooked in the center. Transfer beef to a plate while leaving oil in skillet. 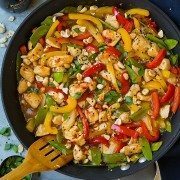 For the veggies: Reduce heat slightly, add bell pepper, onions and garlic and saute until crisp tender, about 2 - 3 minutes (if needed you can add another 1 tsp of oil to the skillet). Add carrots and whisk sauce mixture once more then pour into skillet. Allow sauce to simmer, stirring frequently, until thickened, about 1 minute. 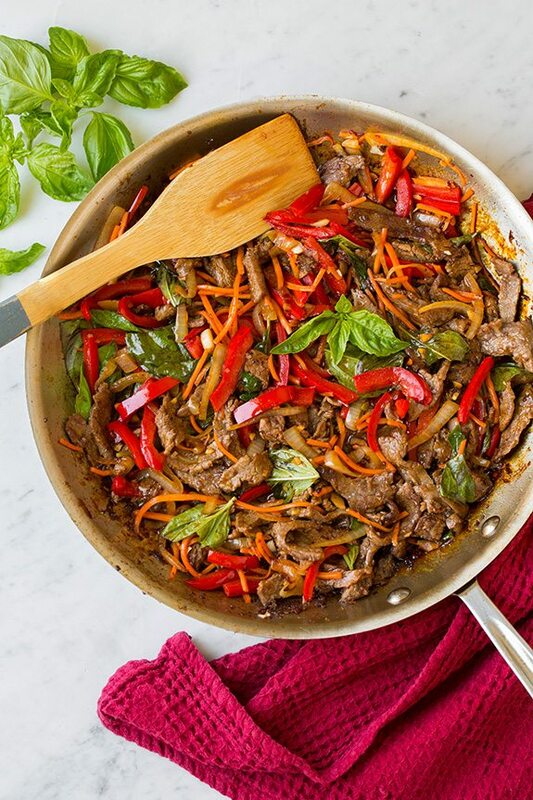 Return beef to skillet along with basil leaves, toss until basil has just wilted. Serve immediately over cooked rice garnished with small basil leaves and sesame seeds if desired.